There is little that will get me out of the house during winter time. Usually it's carpool, and necessary grocery shopping. The combination of cold weather, and three little crazy boys makes staying home a better option to almost anything. But yesterday the Gap had a big sale. 40% off of everything- including clearance, and that was a sale that I could not miss out on. So on a rainy, cold day, I packed up the boys, and Maddy came along, too. We brought some goldfish, and made a deal that if they were good, we would get lunch and play on the Tree House. They agreed. They not only agreed, but they DID IT! They were good. And I found some great deals- jeans for the boys at $6 a pair, you just can't beat that! So with the help of Maddy, and a double stroller, we survived the crowds and long lines. Well behaved children and really good deals make me a really happy mom. 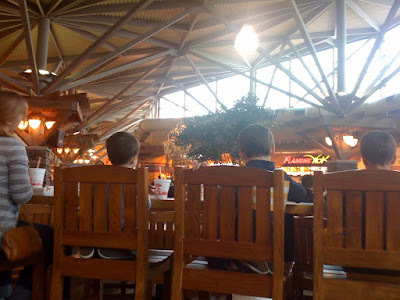 We stopped at the food court, had some Chic-Fil-A, and enjoyed our lunch- quietly. There wasn't any screaming, or crying, or whining, hitting, fighting, or biting. None of that. In fact, while I was passing out Happy Meals, I noticed how calm and quiet my boys were. So unusual. As I ate my lunch, I texted Aaron "the boys are being so good today". And I felt no rush to hurry on to the next place. We could sit here all day, if they wanted to. Whatever made them happy. Eventually, we moved on to the Tree House. And the boys were in heaven. Although, Jack lasted 10 minutes before he was sitting on the bench next to me and Maddy asking for an ipod. As we made our way back to the car, we stopped to visit the fish in Nordstrom, and rode the escalator and the elevator. I had no idea that we could all enjoy being at the mall together. It was the dawn of a new day. But one thing that I did notice is that I never felt rushed. Whatever is was about the day, I felt like we could take our time just doing, and being, and laughing, and playing. And I loved that feeling so much. So, so, so much. So much of my time is spent with me barking out orders that usually begin with hurry- hurry and brush your teeth, hurry and get your shoes on, hurry up and finish your breakfast, hurry, hurry, hurry, we're going to be late to everything. But back to the not feeling rushed thing- it lasted all day. On our way home, we stopped at the store to get food for dinner. We rented a movie that the boys watched while I cooked dinner. And then we had dinner together. Bath time, pajamas, reading, and tucking in. I even laid by all three boys. We talked about the Olympics, sang Primary songs, and Jack held my hand in both of his while trying his best not to fall asleep. It was a day from heaven. When I was in high school, I was convinced that I would die before I was 30. And I would tell my mom, when I had a good day, "Just in case I die today, know that I died a happy girl." So yesterday, as we were climbing into bed, discussing what a good day I had had with our kids, I told Aaron, "Just in case I die today, know that I died a happy girl." And we hugged about it. But I am thankful for the day I had yesterday with my kids. Thankful for the perspective of a good day. Thankful for the happy memories I am making with them. Thankful for the stop and smell the roses kind of day that we enjoyed. And hoping that we can do that more often. And that the Gap has awesome sales more often, too. P.S. I love Maddy- she is my right hand, or in her case, my left hand. And a shout out to Parker for staying with Stella while we were gone. He's my hero. I'm so happy to hear you had a fun time with the boys, just a sampling of what is to come in the future as they continue to grow.Then they will grow up and leave you and you will remember all those fun times together. I'm so happy for you that you had a day like this. It's so funny how something this simple--great deals at the Gap, lunch at the food court and happy boys could make life so good but it can. You give me hope. All I do is yell at my kids lately. I'm praying for more of these kind of days.